Clutter-free kitchens don’t have to be a distant dream. They can become a reality with this foolproof guide to help you keep your kitchen counters clear! The age-old saying of “tidy house, tidy mind” is particularly relevant when it comes to kitchens. For most people, the kitchen is the hub of your home, the central place where you spend the majority of your time, eating, drinking, entertaining and everything else in between! Therefore, it is easy for the place to become cluttered and especially the counter tops. 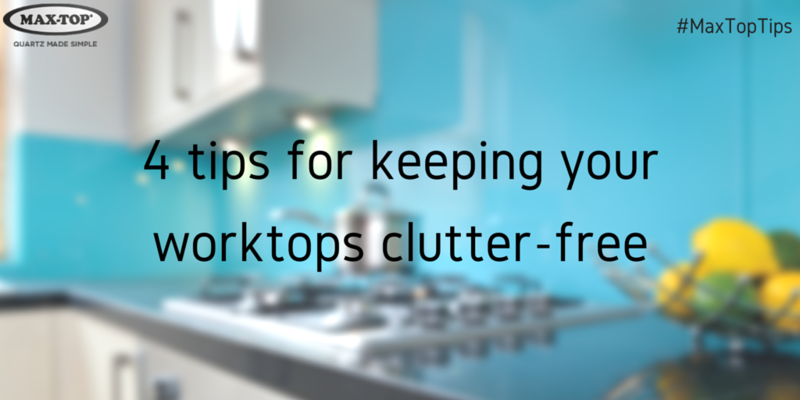 However, have no fear for Maxtop is here to save you from your clutter woes. The first step we suggest for you is to take a day (or maybe even two or three!) to evaluate every last item in your kitchen – and be ruthless. Do you really need that avocado slicer when a simple knife will suffice? Slim down your collection of glasses, plates, pans, bowls, everything. Just keep enough for entertaining purposes. Unless you have over 50 people in your house at once you probably don’t need the same number of mugs. Once you’ve cleared the decks, why not think about sending some items to the charity shop? Step 2: …and no room for the new! So, step number 2 is to not buy any more kitchen utensils! As appealing as that banana bag is, you do not need it. If you feel tempted just take a minute in the shop and ask yourself, “do I really need this Star Wars shaped ice cube mould?” If the answer is no then congratulations you have broken the cycle. And if the answer is yes, then please return to this blog post in 6 months time when you are beginning the clearing out process again. If you are feeling anxious by step 1 and thinking you can’t possibly tackle the overwhelming challenge of junk in your kitchen, keep reading. It’s not all bad news! Even the tidiest of people need to embrace their inner slob every now and again. This can come in the form of a drawer. Now, it is important to stress that this is not a cupboard. It is only a drawer. However, in that drawer, it is your precious space, a sanctuary if you will, to be as lazy and as slobbish as you like. Put in there whatever clutter that you can’t bear to part with, take-away pamphlets and the like. But, be careful to not let this spread to any neighbouring drawers or cupboards! The final step of this guide is to clean your kitchen little and often. Keeping on top of the clutter and not letting it pile up too much will save you time and effort in the long run. Take 10 minutes after breakfast to wipe around and clear away any bowls and cutlery you have used. Repeat this process at the end of the day and you will soon make time for it in your routine, just like brushing your teeth. We hope that these tips will leave you with a beautifully clear kitchen surface that your home will thank you for. Don’t forget to follow us on Twitter and like us on Facebook for more tips and tricks!